Scroll down for results and score sheets for the Sweet 16 and Elite 8 games in the West. To see the Final 4 results click here and scroll to the bottom for how to play your own games for free. Among the 4 Regions in our 32 Conference March Madness brackets to test the Value Add Basketball Game, it seemed the Western Region was the most dangerous for the top seeds as the Big 12 and Pac-12 were one game away from an Elite 8 match-up to play for the Region and a Final Four appearance. The entire bracket of all-conference teams is tracked here. In the previous games the Gonzaga-led WCC easily topped the Summit League 82-64 and the Big West put up the biggest offensive numbers of the entire tournament with a 94-69 thrashing of the WAC The Big West started just as hot against the Big 12 All-Star team. 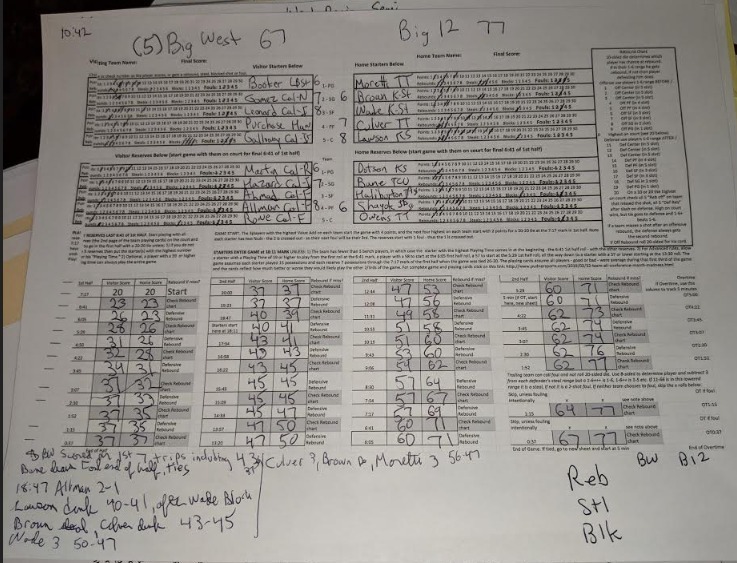 The scored on seven staright possessions (see running score below) including four 3-pointers to take a 37-31 lead over the West 1-seed Big 12. The Big 12 responded with defense to offense, with K-State's Wade blocking a shot and Kansas Lawson dunking at the other end for the Big 12s first lead at 41-40. Then K-State's Brown stole the ball and fed ahead to Texas Tech's Culver for a dunk to make it 45-43. Later a Culver 3 followed by a Brown steal and then Moretti 3 made it 56-47 and en route to a 77-67 win. 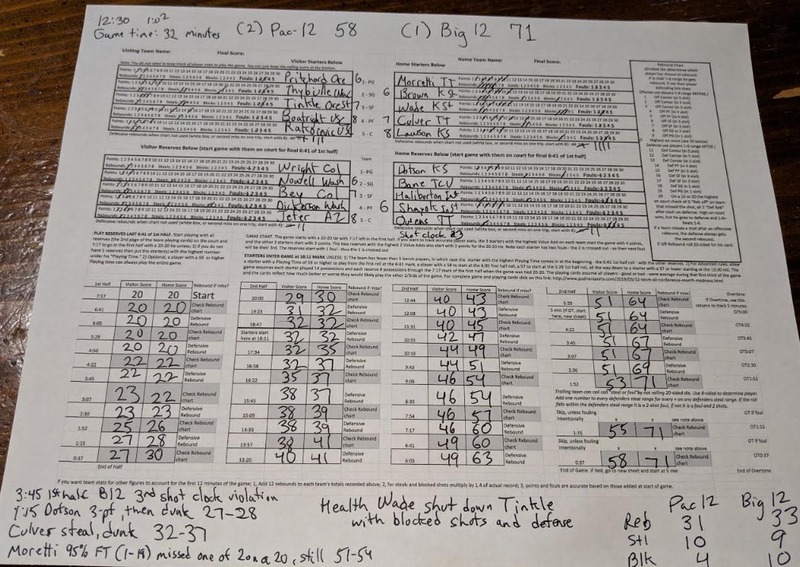 The improved score sheet enables a Value Add Basketball game to be played in 30 to 35 minutes after 5 minutes of writing in the line-ups. The sheet below is the entire game in which the Horizon League upset the Mountain West All-Stars after Nevada's Caleb and Cody Martin both fouled out. Simply put a dash over the next number after a score, rebound, steal, blocked shot or foul while keeping the running score. 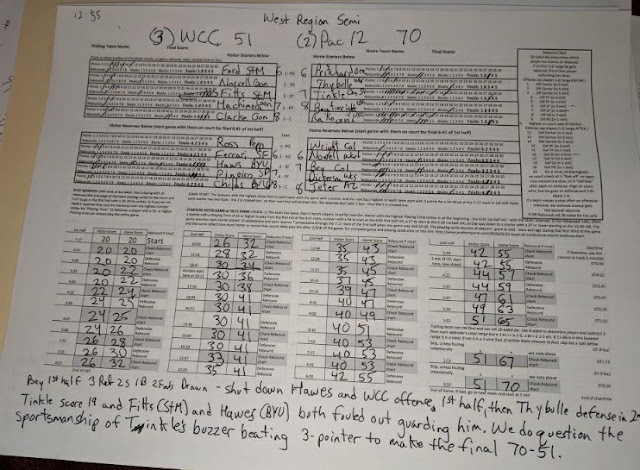 In the other Regional semifinal, the notes across the bottom of the Pac-12 scoresheet below outlines their defensive dominance from the outset, particularly Bey form Colorado. In the two Regions that did feature a 1-seed vs 2-seed Regional Final, the 1-seed won by double digits. The ACC handled the Big East and the Big 12 pulled away from the Pac-12 in the second half for a 71-58 win (see scoresheet below). In addition to three great players from the Texas Tech team that came inches from winning the national title, this team features pre-season but injured Wade who was pre-season national player of the year at www.valueaddbasketball.com but was injured for K-State's first round loss in the real tournament.